Colonel Stephen Blucke led an all-black Regiment that fought for the British during the American Revolution. He settled in Birchtown, Nova Scotia in 1783 and became a leader in the Black Loyalist community. During the Revolutionary War, the most famous of the Black Loyalist Military units were called the Black Pioneers, which contained a small elite band of guerrillas known as the Black Brigade. The Black Brigade fought independently and later with the all-white unit Queen’s Rangers. The supplies they seized were vital to the survival of the Loyalists in New York. In a raid on a patriot militia leader, the Brigade and leader Colonel Tye were caught in a long battle. 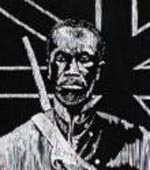 Their target was burned after Tye’s death and Blucke – a literate, free black from Barbados and officer in the Black Pioneers – succeeded Tye as Colonel of the Brigade. At the time, Blucke was the leader of the entire unit and commander of a company of Black Pioneers when they settled in Birchtown. When Blucke arrived in Nova Scotia in June 1783, Port Roseway served as the site of a major loyalist settlement and plans were made for a separate settlement of free blacks near the northwestern part of the harbour. Blucke accompanied the surveyor to the proposed settlement site, which was a large swamp area behind the water’s edge. Colonel Blucke’s company of Black Pioneers and other Black Loyalists soon settled on the water’s edge. Although serious work began in late summer, many of the shelters were hastily built and unfit for Virginia, Carolina and Georgia blacks, who were unaccustomed to northern climates. Land grants to the White Loyalists ranged from fifteen to one hundred fifty acres but 60 percent of the Black Loyalists received very little or no land. As a result Blacks became casual labourers, sharecroppers, and domestic servants. Blucke helped members of the community receive more land and also used his influence in the community to his own advantage. He built a boat and commodious home, attended the Anglican Church, profited from his connection between the black and white communities in the area, and hired out cheap black labour. By 1788, Blucke became increasingly unpopular, amid rumours that he had misappropriated funds. By the time of the Sierra Leone departure, only a fifth of Birchtown’s population was left in the care of Blucke. Three years after the sailing of the fleet, Blucke mysteriously disappeared. Joseph Mensah, Black Canadians: History, Experiences, Social Conditions (Halifax: Fernwood Publishing, 2002); Simon Schama, Rough Crossings: Britain, the Slaves and the American Revolution (Toronto: Penguin Group, 2006); http://www.collectionscanada.gc.ca/confederation/023001-2125-e.html.